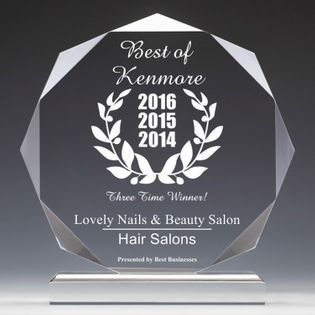 Thank you for visiting our website ,our team are experienced with past ten years to serving in kenmore area .Lovely Nails & Beauty Salon offer high quality services at affordable prices in a relaxing. Our highly skill and friendly staff are well educated in all the latest massage hair and nails care trends and techniques. We offer a unique and fun atmosphere where you can relax and unwind with friends. We have three unit Business in the same building where Barber shop seperate and private for people need quiet. Lovely Nail & Beauty Salon offers: Massage,Hair, Nails, Facial, Eyelash services. Hair services include: Perm, Color, Hi-lite,Hair Extention ,Permanent make-up, Tappers, Layers, Flat Tops - All Styles of Hair cut for Women, Men and Children .